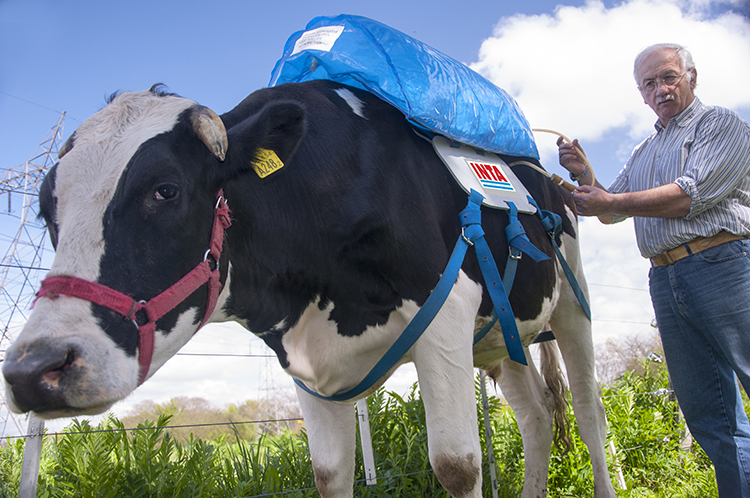 Science + Cows | Small, but valuable. You know I like cows, or you could easily guess that from my post about Peanut’s cows. And my subsequent update about how his cows are doing in Germany. Well, it turns out that cows are a part of some fun new science, too. That same methane release problem that caused an explosion in Germany is being tested as a potential energy resource for the future. Check it out here. This is a rare piece of news that interests everyone in our family of three equally. Scott likes science, especially science that can make you chuckle while being relevant. I like cows, especially cows with funny little backpacks who might also save the world someday. Peanut likes cows. He’s the simplest family member to please. I don’t think that particular cow likes his funny little backpack, but I wouldn’t like a backpack that’s connected to my insides, either. And on that note, happy Friday! !